Looking for cat lovers gifts can be easy... and fun. With so many cat-themed items out there, searching for the perfect gift may be a little daunting. Few of us have enough time and energy to do a thorough research. But there's no need to stress or fret. This site simplifies the whole "gift searching" process. As a devoted kitty lover, I keep abreast of the latest in cat-themed gifts. You'll get all the help you need to find that unique cat gift –- for you or your friend -- right here. And you'll have a good time while you're at it. Finding the perfect cat-lover gift will be a breeze! By the way, I'm always amazed at the variety and originality of the cat-lover products found online. From high-end figurines to inexpensive t-shirts, there is something for everyone. Out-of-the-ordinary gifts include pet portraits, homemade goodies, and yard art. Personalized gifts are a fantastic option as well. Using your own pictures and graphics, you can personalize sweatshirts, cell phone and laptop cases, mousepads, and mugs - among many other items. and a wide array of collectibles, to name a few. You will also find here great pointers and suggestions to help you design your own cat-themed gifts and unleash your creativity! In addition to helping you find the perfect feline-inspired gift, this site contains lots of helpful information and cool facts about felines. You'll find articles about health, behavior, making inexpensive toys for kitty, and other feline-related topics. You'll find it all here. And let's not forget about our feline friends. Do you have an amazing furry friend? You're welcome to tell us her story right here. You can share her picture as well! And while you do so, check out what other feline lovers have posted. Come and be a part of our cat-friendly community. And don't forget to visit the cat lover gifts blog for site updates. So there you have it... have fun while you search for cat gifts for cat lovers. If you love reading and learning about felines, this is the perfect place for you. You will find a host of cat-related articles covering a wide range of subjects. From feline behavior to cat-themed gifts, you will find it here. Do you have a favorite cartoon kitty? Do you have a friend who does? Find here information about your favorite cartoon-cat. You will also find cool cat lovers gifts ideas. Are you looking for a unique name for your kitty? Running out of ideas? Need original, fresh ideas? This guide to feline names may solve your problem. The names listed here are grouped by category for easy reference. The gift of feline-inspired art is a favorite among many feline lovers. Find here a guide to the different kinds of feline-inspired art. The best part is that you will find fabulous pieces at basement prices. And they make great cat lovers gifts, of course. If you are looking for practical cat lovers gifts, consider feline furniture. This article gives you information about the different types of feline furniture. You will also find here tips on how to pick the best piece for your furry friend. The Cat Lover Gifts blog brings you the latest additions to this website, including updates and changes - all conveniently located in one place. You and your cat need a cozy spot to cuddle up and enjoy each other's company. And guess what, you've come to the right place. Here you can come in, sit down, relax, and share all about your cat. Send cat-themed free ecards to your feline-loving friends. Cat e cards offer a quick and easy way to celebrate any special occasion, such as Valentine's Day, Christmas and Birthdays. Cat lover gifts search makes it easy to find what you're looking for. Cartoon Cats: Felix, Garfield, Krazy Kat, Sylvester and more! Find Your Favorite Cartoon Cat! Cat Art: Cat paintings, Cat prints, Cat posters and more! Unique cat art for feline lovers. Find the perfect gift of feline art: Posters, Paintings, Prints, Pet Portraits, Statues and more! Whether you are looking for something fun or expert information, cat kitten magazines are the answer. Find here a list of the best cat kitten magazines. They make great gifts too. A cat t-shirt is a fun and affordable gift! You can find online many designs to choose from. Many online stores even allow you to design your own cat-themed t-shirt. A cat toy will make you feline friend happy! A cat toy makes the perferct gift for your kitty. There is a wide array of cat toys: mouse toys, catnip toys, interactive toys and more! Cat furniture is a practical gift for feline lovers. There are many options to choose from: cat condos, cat houses, beds, and more. Find here great tips to pick the best pet furniture. Cat Collectibles: Find a special treasure for all the feline lovers on your list. Tips and ideas to help you choose one-of-a-kind cat collectables. Cat Figurines: A great gift for any collector. Find here tips to find delightful cat figurines and start a collection. Figurines make a wonderful cat-lover gift. Dazzle your cat-loving friends with a unique piece of cat jewelry. There is a wide variety of pieces of animal jewelry and cat lovers jewelry to choose from. A cat calendar is indeed a unique, fun and affordable cat lover gift. You can find a wide selection of cat calendars online. You can also design your own calendars. Looking for a cat book, cat manual, or books about literary cats? A cat book is a great gift idea for cat lovers. You can find cat books on a wide variety of topics including feline health, care and behavior. The "cat who books" are very popular, too. If you love cats, you love cat pictures. If you are looking for a special cat picture, welcome. This is a fun guide to pictures of cats. Looking for cat gifts? You're in luck. Here you'll find several ideas to help you choose the perfect cat gift. Fortunately, there are lots of places online where you can find a unique pet gift. Looking for unique cat gifts? Give something out-of-the-ordinary: gift baskets, cookie jars and more. Find tips and unique cat gift ideas here. Products for cat lovers are easily found online. But if you can't decide which one to buy, here's some help. There are many advantages to owning an automatic cat litter box. The most important one is that you no longer need to scoop kitty poop. Learn here how to choose the right automatic litterbox. Cat Articles: A great way to learn new things about cats! Cat Articles are a great source of feline information! Here you can find information on different topics such as: feline breeds, behavior, cat-themed gifts and more! Cat Resources: A comprehensive list of resources for you and your kitty. 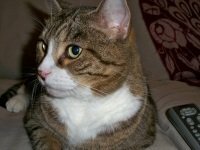 Cat breeds - A comprehensive list of breeds. Interested in learning about the different breeds of cats? You'll find this information very helpful. Learn about the different types of cats. From different coat types to semi-wild felines. Do you have a favorite cat type? Catnip: Learn more about this plant and its effects on felines (the catnip-response). Also find several gifts ideas, including toys, and much more! There are many cat eye problems. This article will help you identify common eye problems in cats. It will also give you several tips to help you prevent feline eye problems. Cat conjunctivitis, also known as cat pink eye, is the inflammation of the conjunctiva, a thin membrane that covers the eyes' outer layer and the inner eyelid. Learn more about feline conjunctivitis. The proper cat eye care can htelp prevent many common feline eye problems. The first step is to check your kitty's eyes regularly. Asthma in cats is a chronic inflammatory condition that affects the airways. This disorder is also known as feline bronchial disease. Learn about cat asthma symptoms, diagnosis and treatment here. Cat Allergy Symptoms - Are You Allergic to Cats? Are you allergic to cats? Learning about cat allergy symptoms can help you answer this question. Here you will find information about the diagnosis, treatment and different symptoms of cat allergies. Cat Names - Looking for an out-of-the-ordinary cat name? Feeling stumped? Here your will find 20 sources of inspiration to help you find a unique name for kitty. These cat videos will cheer you up! Watch cats talking, dancing, even playing the piano. The talking cat video is my favorite. What is your favorite cats video? Cat Quotes - It seems like everyone has something to say about cats. Here you'll find feline quotes from writers, musicians, artists, and others. Quotes about cats abound. It seems like cats make us think deep. Here's a fun, and sometimes philosophical, collection of cat quotes. Interesting facts about cats. Fun cat facts, health facts, facts about the influence of felines on pop culture and art... it's all here. Cat Stuff: Cat Games, Cat News, Cat Photos, and more. Fun cat stuff that will delight any cat lover: from funny pictures and fun games, to cat news, announcements, tips, and much more. The sitemap of www.cat-lovers-gifts-guide.com is an overview of the different sections of this site. Find whatever you’re looking for quickly using the site map for www.cat-lovers-gifts-guide.com. Learn more about this site. This page gives you more information about the publisher of Cat-Lovers-Gifts-Guide.com. Site rules: This page describes the rules that govern cat-lovers-gifts-guide.com. Disclosure of compensation received by the owners of this website.